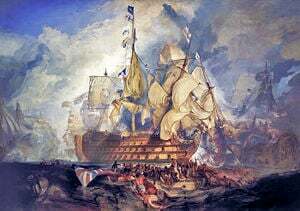 The Battle of Trafalgar (/trə'fælɡər/, formerly /træfəl'ɡɑr/), fought on October 21, 1805, was part of the War of the Third Coalition assembled by Britain against France. It was the most significant naval battle of the Napoleonic Wars and a pivotal naval battle of the nineteenth century. A Royal Navy fleet of 27 ships of the line destroyed an allied French and Spanish fleet of 33 ships of the line west of Cape Trafalgar in south-west Spain. The French and Spanish lost 22 ships, while the British lost none. The British commander Admiral Lord Horatio Nelson died late in the battle, by which time he had ensured his place in history as Britain's greatest naval hero. The British victory spectacularly confirmed the naval supremacy that Britain had established during the eighteenth century. Many believe that the battle prevented France from invading England. However, by the time it was fought, Napoleon had abandoned his plans to invade southern England and instead was successfully fighting in Germany against Britain's allies. Britain's sea-power would continue through until the end of World War II, and during two World Wars would play a major role in the defense of freedom and democracy against tyranny and oppression. The memory and legacy of Trafalgar became part of the heritage of Britain's navy. In times of hardship and difficulty, sailors would remember Nelson's words, and, even in the face of superior force, would do their duty. In 1805, the First French Empire, under Napoleon, was the dominant military land power on the European continent, while the British Royal Navy controlled the seas. During the course of the war, the British imposed a naval blockade on France, which affected trade and kept the French from fully mobilizing their own naval resources. 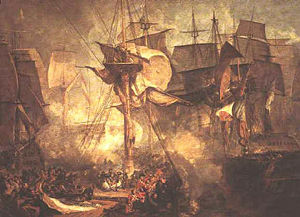 Despite several successful evasions of the blockade by the French navy, it was unable to inflict a major defeat on the British. The British were able to attack French interests at home and abroad with relative ease. The main French fleets were at Brest in Brittany and at Toulon on the Mediterranean coast. Other ports on the French Atlantic coast contained smaller squadrons. In addition, France and Spain were allied, so the Spanish fleet, based in Cádiz and Ferrol, was also available. Napoleon's naval plan in 1805 was for the French and Spanish fleets in the Mediterranean and Cádiz to break through the blockade and combine in the West Indies. They would then return, assist the fleet in Brest to emerge from blockade, and in combination clear the English Channel of Royal Navy ships, ensuring a safe passage for the invasion barges. The plan seemed good on paper but as the war dragged on, Napoleon's unfamiliarity with naval strategy and ill-advised naval commanders continued to haunt the French. Early in 1805, Admiral Lord Nelson commanded the British fleet blockading Toulon. Unlike William Cornwallis, who maintained a tight blockade of Brest with the Channel Fleet, Nelson adopted a loose blockade in hopes of luring the French out for a major battle. However, Villeneuve's fleet successfully evaded Nelson's when his forces were blown off station by storms. While Nelson was searching the Mediterranean for him, Villeneuve passed through the Straits of Gibraltar, rendezvoused with the Spanish fleet, and sailed as planned to the West Indies. Once Nelson realized that the French had crossed the Atlantic Ocean, he set off in pursuit. Admirals of the time, due to the slowness of communications, were given considerable autonomy to make strategic as well as tactical decisions. When Villeneuve set sail from Ferrol on August 10, he was under strict orders from Napoleon to sail northward toward Brest. Instead, he worried that the British were observing his maneuvers, so on August 11, he sailed southward towards Cádiz on the southwestern coast of Spain. With no sign of Villeneuve's fleet by August 26, the three French army corps invasion force near Boulogne broke camp and marched to Germany, where it would become fully engaged. The same month, Nelson returned home to England after two years of duty at sea, for some well-earned rest. He remained ashore for 25 busy days, and was warmly received by his countrymen, who were understandably nervous about a possible French invasion. Word reached England on September 2, about the combined French and Spanish fleet in the harbor of Cádiz. Nelson had to wait until September 15, before his ship HMS Victory was ready to sail. On August 15, Cornwallis made the fateful decision to detach 20 ships of the line from the fleet guarding the channel and to have them sail southward to engage the enemy forces in Spain. This left the channel somewhat denuded of ships, with only eleven ships of the line present. However this detached force formed the nucleus of the British fleet that would fight at Trafalgar. Initially this fleet was placed under the command of Vice-Admiral Calder, reaching Cádiz on September 15. Nelson joined the fleet on September 29, to take command. The British fleet used frigates to keep a constant watch on the harbor, while the main force remained out of sight 50 miles (80 km) west of the shore. Nelson's hope was to lure the combined Franco-Spanish force out and engage them in a "pell-mell battle." The force watching the harbor was led by Captain Blackwood, commanding HMS Euryalus. He was brought up to a strength of seven ships (five frigates and two schooners) on October 8. At this point, Nelson's fleet badly needed provisioning. On October 2, five ships of the line, Queen, Canopus, Spencer, Zealous, Tigre, and the frigate Endymion were dispatched to Gibraltar under Rear-Admiral Louis for supplies. These ships were later diverted for convoy duty in the Mediterranean, whereas Nelson had expected them to return. Other British ships continued to arrive, and by October 15, the fleet was up to full strength for the battle. Although it was a significant loss, once the first-rate Royal Sovereign had arrived, Nelson allowed Calder to sail for home in his flagship, the 98-gun Prince of Wales. Calder's apparent lack of aggression during the engagement off Cape Finisterre on July 22, had caused the Admiralty to recall him for a court martial and he would normally have been sent back to Britain in a smaller ship. Meanwhile, Villeneuve's fleet in Cádiz was also suffering from a serious supply shortage that could not be readily rectified by the cash-strapped French. The blockades maintained by the British fleet had made it difficult for the allies to obtain stores and their ships were ill fitted. Villeneuve's ships were also more than two thousand men short of the force needed to sail. These were not the only problems faced by the Franco-Spanish fleet. The main French ships of the line had been kept in harbor for years by the British blockades with only brief sorties. The hasty voyage across the Atlantic and back used up vital supplies and was no match for the British fleet's years of experience at sea and training. The French crews contained few experienced sailors, and as most of the crew had to be taught the elements of seamanship on the few occasions when they got to sea, gunnery was neglected. Villeneuve's supply situation began to improve in October, but news of Nelson's arrival made Villeneuve reluctant to leave port. Indeed his captains had held a vote on the matter and decided to stay in the harbor. On the September 14, Napoleon gave orders for the French and Spanish ships at Cadiz to put to sea at the first favorable opportunity, join seven Spanish ships of the line then at Cartagena, go to Naples, and land the soldiers they carried to reinforce his troops there, and fight a decisive action if they met a British fleet of inferior numbers. During the period of blockade off the coast of Spain in October Nelson instructed his captains as to how he meant to fight the approaching battle over two dinners aboard Victory. The governing principles of his instructions were that the order of sailing in which the fleet was when the enemy was seen was to be the order of battle; that no time was to be wasted in forming a precise line; that the attack was to be made in two bodies, of which one, to be led by the second in command, Collingwood, was to throw itself on the rear of the enemy, while the other, led by Nelson himself, was to take care that the center and vanguard could not come to the assistance of the cut-off ships. Nelson was careful to point out that something had to be left to chance. Nothing is sure in a sea fight beyond all others; and he left his captains free from all hampering rules by telling them that, "No captain can do very wrong if he places his ship alongside that of the enemy." In short, the execution was to be as circumstances dictated, subject to the guiding rule that the enemy's rear was to be cut off and superior force concentrated on that part of the enemy's line. The plan had three principal advantages. Firstly, it would allow the British fleet to close with the French-Spanish fleet as quickly as possible, reducing the chance that it would be able to escape without fighting. Secondly, it would quickly bring on a mêlée or pell-mell battle, by breaking the French-Spanish line and inducing a series of individual ship-to-ship fights, in which the British were likely to prevail. Nelson knew that the better seamanship, faster gunnery, and higher morale of his crews were decisive advantages that could not be compensated for by any amount of bravery on the part of their opponents. Thirdly, it would bring a decisive concentration on the rear of the French-Spanish fleet. The ships in the van of the enemy fleet would have to turn back to support the rear, which would take a long time. The main drawback of attacking head on was that the Franco-Spanish ships would be able to maintain a raking broadside fire on the bows of the leading British ships as they approached, to which the British ships would be unable to reply. However, Nelson was well aware that French and Spanish gunners were ill-trained, would in all probability be supplemented with soldiers, and would have difficulty firing accurately from a moving gun platform. In the event, the Combined Fleet was sailing across a heavy swell, causing the ships to roll heavily and exacerbating the problem. Nelson's plan was indeed a gamble, but a carefully calculated one. Nelson's plan was a radical break from the prevailing tactical orthodoxy, which involved maneuvering to approach the enemy fleet in a single line of battle and then engaging in a parallel line. The intention of going straight at the enemy echoed the tactics used by Admiral Duncan at the Battle of Camperdown and Admiral Jervis at the Battle of Cape St. Vincent, both in 1797. In preparation for the battle, Nelson ordered the ships of his fleet painted in a distinctive yellow and black pattern (later known as the Nelson Chequer) that would make them easy to distinguish from their opponents. On October 18, Villeneuve received a letter informing him that Vice-Admiral François Rosily had arrived in Madrid with orders to take command. At the same time, he received intelligence that a detachment of six British ships had docked at Gibraltar (this was Admiral Louis's squadron). Stung by the prospect of being disgraced before the fleet, Villeneuve resolved to go to sea before his successor could reach Cadiz. Following a gale on October 18, the fleet began a rapid scramble to set sail. The weather, however, suddenly turned calm following a week of gales. This slowed the progress of the fleet departing the harbor, giving the British plenty of warning. Villeneuve had drawn up plans to form a force of four squadrons, each containing both French and Spanish ships. Following their earlier vote to stay put, the captains were reluctant to leave Cádiz and as a result they failed to follow closely Villeneuve's orders (Villeneuve had reportedly become despised by many of the fleet's officers and crew). As a result, the fleet straggled out of the harbor in no particular formation. 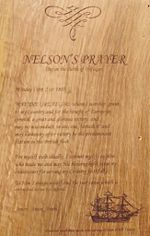 Nelson's pre-battle prayer, inscribed on oak timber from HMS Victory. It took most of October 20, for Villeneuve to get his fleet organized, and it set sail in three columns for the Straits of Gibraltar to the south-east. That same evening, the ship Achille spotted a force of 18 British ships of the line in pursuit. The fleet began to prepare for battle and during the night they were ordered into a single line. The following day Nelson's fleet of 27 ships of the line and four frigates was spotted in pursuit from the north-west with the wind behind it. Villeneuve again ordered his fleet into three columns, but soon changed his mind and ordered a single line. The result was a sprawling, uneven formation. At 8 a.m., Villeneuve ordered the fleet to "wear together" and turn back for Cádiz. This reversed the order of the Allied line, placing the rear division under Rear-Admiral Pierre Dumanoir le Pelley in the vanguard. The wind became contrary at this point, often shifting direction. The very light wind rendered maneuvering all but impossible for the most expert crews. The inexperienced crews had difficulty with the changing conditions, and it took nearly an hour and a half for Villeneuve's order to be completed. The French and Spanish fleet now formed an uneven, angular crescent, with the slower ships generally leeward and closer to the shore. Villeneuve was painfully aware that the British fleet would not be content to attack him in the old-fashioned way, coming down in a parallel line and engaging from van to rear. He knew that they would endeavor to concentrate on a part of his line. But he was too conscious of the inexperience of his officers and men to consider making counter movements. The six British ships dispatched earlier to Gibraltar had not returned, so Nelson would have to fight without them. He was outnumbered and outgunned, nearly 30,000 men and 2,568 guns to his 17,000 men and 2,148 guns. The Franco-Spanish fleet also had six more ships of the line, and so could more readily combine their fire. There was no way for some of Nelson's ships to avoid being "doubled on" or even "trebled on." The battle progressed largely according to Nelson's plan. At 11:45, Nelson sent the famous flag signal, "England expects that every man will do his duty." He had instructed his signal officer, Lieutenant John Pasco, to signal to the fleet the message "England confides [i.e. is confident] that every man will do his duty." Pasco suggested to Nelson that "expects" be substituted for "confides," since the former word was in the signal book, whereas "confides" would have to be spelled out letter-by-letter. Nelson agreed to the change. The term England was widely used at the time to refer to the United Kingdom, though the British fleet included significant contingents from Ireland, Scotland, and Wales as well as England. Unlike the photographic depiction, this signal would have been shown on the mizzen mast only and would have required 12 "lifts." The fleet was approaching the French line in two columns. Leading the windward column in Victory was Nelson, while Collingwood in Royal Sovereign led the second, leeward, column. Just before his column engaged the allied forces, Collingwood said to his officers, "Now, gentlemen, let us do something today which the world may talk of hereafter." Because the winds were very light during the battle, all the ships were moving extremely slowly, and the lead British ships were under fire from several of the enemy for almost an hour before their own guns could bear. At noon, Villeneuve sent the signal "engage the enemy," and Fougueux fired her first trial shot at Royal Sovereign. Royal Sovereign had all sails out and, having recently had her bottom cleaned, outran the rest of the British fleet. As she approached the allied line, she came under fire from Fougueux, Indomptable, San Justo, and San Leandro, before breaking the line just astern of Admiral Alava's flagship Santa Ana, into which she fired a devastating double-shotted raking broadside. The second ship in the British lee column, Belleisle, was engaged by Aigle, Achille, Neptune, and Fougeux; she was soon completely dismasted, unable to maneuver and largely unable to fight, as her sails blinded her batteries, but kept flying her flag for 45 minutes until the following British ships came to her rescue. For 40 minutes, Victory was under fire from Héros, Santísima Trinidad, Redoutable, and Neptune; although many shots went astray, others killed and wounded a number of her crew and shot away her wheel, so that she had to be steered from her tiller below decks. Victory could not yet respond. At 12:45, Victory cut the enemy line between Villeneuve's flagship Bucentaure and Redoutable. Victory came close to the Bucentaure, firing a devastating raking broadside through her stern which killed and wounded many on her gundecks. Villeneuve thought that boarding would take place, and with the Eagle of his ship in hand, told his men: "I will throw it onto the enemy ship and we will take it back there!" However Admiral Nelson of Victory engaged the 74 gun Redoutable. Bucentaure was left to be dealt with by the next three ships of the British windward column Temeraire, Conqueror, and Neptune. A general mêlée ensued and, during that fight, Victory locked masts with the French Redoutable. The crew of the Redoutable, which included a strong infantry corps (with 3 captains and 4 lieutenants), gathered for an attempt to board and seize the Victory. A musket bullet fired from the mizzentop of the Redoutable struck Nelson in the left shoulder and passed through his body, lodging in his spine. Nelson exclaimed, "They finally succeeded, I am dead." He was carried below decks and died at about 16:30, as the battle that would make him a legend was ending in favou=r of the British. At 13:55, Captain Lucas, of the Redoutable, with 99 fit men out of 643 and severely wounded himself, was forced to surrender. The French Bucentaure was isolated by the Victory and Temeraire, and then engaged by Neptune, Leviathan, and Conqueror; similarly, the Santísima Trinidad was isolated and overwhelmed without being rescued, surrendering after three hours. As more and more British ships entered the battle, the ships of the allied center and rear were gradually overwhelmed. The allied van, after long remaining quiescent, made a futile demonstration and then sailed away. The British took 22 vessels of the Franco-Spanish fleet and lost none. Among the taken French ships were the Aigle, Algésiras, Berwick, Bucentaure, Fougueux, Intrépide, Redoutable, and Swiftsure. The Spanish ships taken were Argonauta, Bahama, Monarca, Neptuno, San Agustín, San Ildefonso, San Juan Nepomuceno, Santísima Trinidad, and Santa Ana. Of these, Redoutable sank, Santísima Trinidad and Argonauta were scuttled by the British and later sank, Achille exploded, Intrépide and San Augustín burned, and Aigle, Berwick, Fougueux, and Monarca were wrecked in a gale following the battle. The four van ships which escaped with Dumanoir were taken on November 4, by Sir Richard Strachan at the Battle of Cape Ortegal. 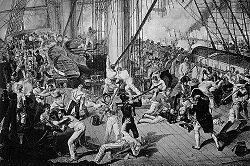 All of the Royal Marine Corps officers in the HMS Victory were killed, leaving the Sergeant Major of Marines (who was first by Nelson's side when he was hit) in command of Victory's Marine detachment. Vice-Admiral Villeneuve was taken prisoner and taken back to England. After his return to France, and on his way to Paris, Villeneuve was found in his inn room stabbed six times in the chest with a dining knife. The verdict was that he had committed suicide. The Battle took place the very day after the Battle of Ulm, and Napoleon did not hear about it for a few weeks—the Grande Armée had left Boulogne to meet Britain's allies before they could muster a huge force. He had tight control over the Paris media and kept the defeat a closely guarded secret. In a propaganda move, the battle was declared a "spectacular victory" by the French and Spanish. Less than two months later, the War of the Third Coalition ended with a decisive French victory over Russia and Austria, Britain's allies, at the Battle of Austerlitz. Prussia decided not to join the Coalition and, for a while, France was at peace again. However, it could no longer defeat Britain at sea, so Napoleon went on to impose a continental blockade in an attempt to deny Britain trade with the continent. Detail from an 1805 poster commemorating the battle. A broadside from the 1850s recounts the story. Following the battle, the Royal Navy was never again seriously challenged by the French fleet in a large-scale engagement. Napoleon had already abandoned his plans of invasion before the battle and they were never revived. Nelson became—and remains—Britain's greatest naval war hero, and an inspiration to the Royal Navy, yet his unorthodox tactics were only infrequently emulated by later generations. The first monument to be erected in Britain to commemorate Nelson was raised on Glasgow Green in 1806, possibly preceded by a monument at Taynuilt, near Oban dated 1805, both also commemorating the many Scots crew and captains at the battle. The 44 m (144 ft) tall Nelson Monument on Glasgow Green was designed by David Hamilton and paid for by public subscription. Around the base are the names of his famous victories: Aboukir (1798), Copenhagen (1801) and Trafalgar (1805). In 1808, Nelson's Pillar was erected in Dublin to commemorate Nelson and his achievements (many sailors at Trafalgar had been Irish), and remained until it was blown up by "Old IRA" members in 1966. Nelson's Monument in Edinburgh was built between 1807 and 1815 in the form of an upturned telescope, and in 1853 a time ball was added which still drops at noon GMT to give a time signal to ships in Leith and the Firth of Forth. In summer this coincides with the "one o'clock gun" being fired. 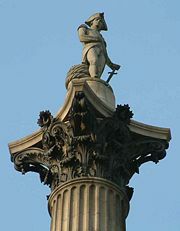 London's famous Trafalgar Square was named for his victory, and Nelson's statue atop Nelson's Column, finished in 1843, towers triumphantly over it. The disparity in losses has been attributed by some historians less to Nelson's daring tactics, than to the difference in fighting readiness of the two fleets. Nelson's fleet was made up of battle-hardened ships of the line, drilled in countless skirmishes during months of blockades of French ports, whilst the French fleet had generally been used merely to supply troops. As such, the battle could be seen as an inevitable massacre by an overwhelmingly superior enemy, but this scarcely diminishes its symbolic importance. An anecdotal consequence is that French Navy officers have not been called "sir" ever since. In 2005, a series of events around the UK, as part of the Sea Britain theme, marked the bicentenary. The 200th anniversary of the battle was also marked by six days of celebrations in Portsmouth during June and July, and at St Paul's Cathedral (where Nelson is entombed) and in Trafalgar Square in London in October ("T Square 200"), as well as across the rest of the UK. On 28 June, the Queen was involved in the biggest Fleet Review in modern times in the Solent, in which 167 ships from 35 nations took part. The Queen inspected the international fleet from the Antarctic patrol ship HMS Endurance. The fleet included six carriers: Charles De Gaulle, Illustrious, Invincible, Ocean, Príncipe de Asturias, and Saipan. The frigate Grand Turk played the part of HMS Victory in a symbolic re-enactment of the battle. Lapenotiere's historic voyage in HMS Pickle bringing the news of victory from the fleet to Falmouth and thence by post chaise to the Admiralty in London, was commemorated by the New Trafalgar Dispatch and Trafalgar Way celebrations, from July to September, in which an actor played the part of Lapenotiere and reenacted the historic journey. On October 21, naval maneuvers were conducted in Trafalgar Bay, near Cadiz, involving a combined fleet from Britain, Spain, and France. Many descendants of those men who fought and died in these waters, including members of Nelson's family, were present at the ceremony. ↑ Historical Maritime Society, Nelson and His Navy. Retrieved June 6, 2007. ↑ 24 Hour Museum, England Expects—On the Trial of Admiral Lord Nelson. Retrieved June 6, 2007. 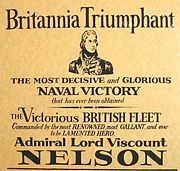 ↑ 24 Hour Museum, First Sea Lord Sir Alan West on Nelson and Trafalgar. Retrieved June 6, 2007. Adkins, Roy, Trafalgar: The Biography of a Battle,London: Little Brown, 2004 ISBN 0-316-72511-0. Desbrière, Edouard, The Naval Campaign of 1805: Trafalgar, 1907, Paris. English translation by Constance Eastwick, Oxford: Clarendon, 1933. Howarth, David, Trafalgar: The Nelson Touch, New Haven, CT: Phoenix Press, 2003. ISBN 1-84212-717-9. Pope, Dudley, England Expects (U.S. title Decision at Trafalgar), London: Weidenfeld and Nicolson, 1959. The London Gazette Extraordinary, November 6, 1805 original published dispatches, Naval History: Great Britain, EuroDocs: Primary Historical Documents From Western Europe, Brigham Young University Library. HMS Victory Royal Navy Web Site. Nelson, Trafalgar and those who served. BBC video (42 min.) of the re-enactment of the Battle of Trafalgar off Portsmouth on 28th June 2005. Todo a Babor. La Batalla de Trafalgar,The battle of Trafalgar (Spanish). History of "Battle of Trafalgar"
This page was last modified on 20 May 2016, at 22:20.